Every morning at Cottonwoods Rehab, the sun rising above the soaring Ship Rock formation is the first thing Skye Elliot sees. Not that it makes her particularly happy. After the car accident that broke her four-year-old daughter’s wrist, rehab was one choice offered by the judge. The other was jail. Making matters worse, custody of Gracie was awarded to Rocky, Skye’s hard- partying, bull-riding ex-husband. Now nothing matters to Skye except getting her daughter back. But when released after nine months, there is no trace of Gracie. The only person who will help her search is Owen Garrett, the alcoholic father Skye hasn’t seen or heard from since she was 12 years old. He’s sober now, but with his own past to reconcile. 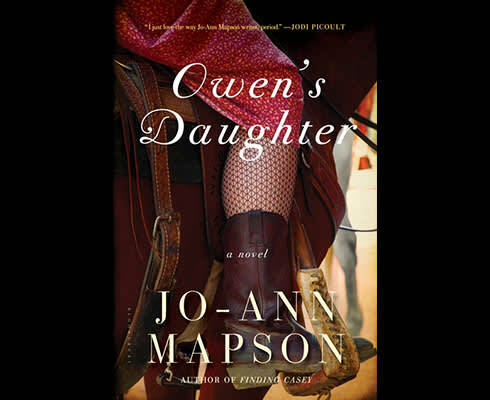 Owen’s Daughter, Jo-Ann Mapson’s twelfth novel, is part of a series, but it stands on its own. Glory and Joseph Vigil, from Solomon’s Oak and Finding Casey, live next to Margaret Yearwood, from Blue Rodeo, near Canyon Road in Santa Fe. Joseph is now the founder of Reach for the Sky, a nonprofit that teaches horsemanship to at-risk youth. When Owen lands a job at the stable, Skye also starts giving trail rides and gets a chance to feel useful again. It’s been 10 years since Owen left Margaret, an artist who shelved her ambitions and paints small watercolors of cacti and sunsets for gift shops. She has an unfinished painting of Owen’s horse RedBow sitting on an easel, and has been unable to complete the last few brushstrokes that tie her to him. The book is set primarily in Santa Fe, and the town and the New Mexico landscape are as vividly written as the many characters. Artists are everywhere; the winds bring grit and the scent of piñon and sage. Mapson integrates the many cultures, galleries, and gourmet markets with a sense of history that runs like a current just below modern life. Clearly Mapson, a California native who now lives in Santa Fe and admits to an obsession with Old Gringo boots, has adapted well. Some of the history is revealed through an interesting source. Margaret is not alone in her old adobe. A ghost named Dolores lives there as well. She narrates the story of all that’s happened on that parcel of land since she died there many years ago. This perspective from the spirit world brings an element of grace to the lives of the people navigating their own struggles, and a sense of comfort to the reader looking for the same. Mapson tells a story that will appeal to those interested in exploring the bonds of people to family, animals, and the land, as well as to those who enjoy a love story. Readers who prefer their novels with more hope and resolution than real life sometimes offers will not be disappointed. Julie Geen has published fiction and essays in several anthologies and writes for the Arts and Culture section of Richmond, Virginia’s Style Weekly.